Since the inception of the premium Pelikan Edelstein line of fountain pen inks, the German manufacturer of fine fountain pens and inks debuts a new color that is referred to as the "ink of the year." To follow last year's purplish Turmaline, we go across the color wheel to a golden-orange "Amber." Orange or yellow inks tend to fall into one of two categories - too unsaturated to show up well on paper or too vibrant and ostentatious to be taken seriously. 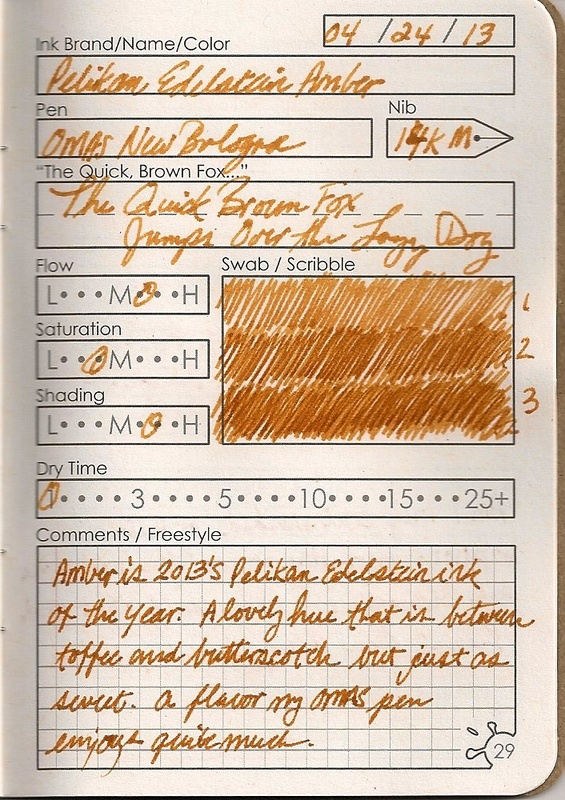 Pelikan's 2013 Edelstein Amber is like a rich honey gold. It shades well, has enough saturation to contrast against white and ivory papers and flows moderately. 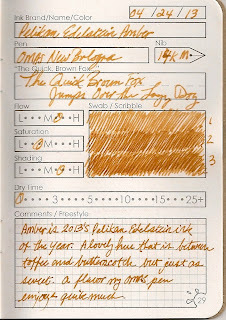 The InkJournal page entry below will show more detail about the hue and shading quality. Although you can try a 5mL sample on our sister website RefillFinder.com, you would do better to buy a whole bottle while they are still available. True, we still have some inventory of the 2012 Turmaline color, but you can never tell when Pelikan will run out.